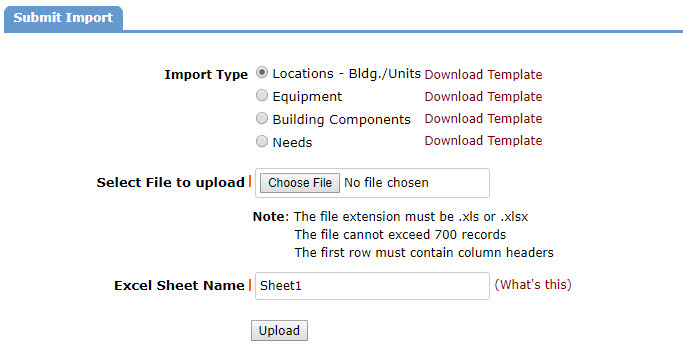 To import new Locations and Bldg./Units, you will use an Excel template available in your account to fill in the information that is necessary when adding a Location or Bldg./Unit. Click on the Download Template link next to Locations - Bldg./Units and open the file. The Locations and Bldg./Units Import Template spreadsheet will open in Excel. Each row in the spreadsheet will be a new Location that is imported into your account and each column represents information that can be added to the Location you are importing. Location Code- this field can be left blank when importing a new Location. If you need to enter a Location Code, be sure it is unique to the Location. If a Location Code is entered that matches an existing Location Code in your account, the record will be updated rather than created. Location(required)- enter the name of the Location in this field. If a Location is entered that matches an existing Location in your account, the record will be updated rather than created. Location Date Built(required) - Enter the date the Location was built in mm/dd/yyyy format. Location Square Footage- enter the Square Footage of the Location. *Note: While this field is not required, we strongly recommend entering this information if you are using Capital Forecast's included model values and Building Types. Location Notes- enter any additional notes about the Location. Bldg./Unit Code- this field can be left blank when importing a new Bldg./Unit. If you need to enter a Bldg./Unit Code, be sure it is unique to the Bldg./Unit. If a Bldg./Unit Code is entered that matches an existing Bldg./Unit Code in your account, the record will be updated rather than created. Bldg./Unit(required if you are importing Bldg./Units and your account is set to model based on Bldg./Units)- enter the name of the Bldg./Unit in this field. If a Bldg./Unit is entered that matches an existing Bldg./Unit in your account, the record will be updated rather than created. Bldg./Unit Date Built(required if you are importing Bldg./Units and your account is set to model based on Bldg./Units) - Enter the date the Bldg./Unit was built in mm/dd/yyyy format. Bldg./Unit Square Footage- enter the Square Footage of the Bldg./Unit. *Note: While this field is not required, we strongly recommend entering this information if you are using Capital Forecast's included model values and Building Types. Building Type(required) - Select the Building Type the best matches the Location or Bldg./Unit you are importing. *Note: If you are using a custom Building Type, it must be created in the account before importing. Be sure to type the your custom Building Type name exactly as it appears in your account. CRV- enter the CRV as a number, not a currency. *Note: The CRV will automatically be calculated based on the Location/Bldg./Unit Square Footage and Building Type if no value is entered.